Advanced Hair Studio has treated some of Australia’s biggest sporting and cultural personalities. Shane Warne, an undisputed legend of the game of cricket, has been working with us since 2006. Following his hugely successful treatments, he has become our brand ambassador. A global sporting icon, Shane Warne was one of the greatest bowlers in the history of cricket, and is an established household name. The second-highest wicket taker of all time, Warne was one of the driving forces behind Australia’s dominant form in the international cricket scene from the mid-1990s. Warne often showed his brilliance in The Ashes Test Series against England – one of the highest profile sporting contests in the world. Shane Warne has led an active life since his retirement from cricket, becoming an established media personality with leading, incisive cricket commentary on the Nine Network. Warne is also an established figure in sports-based philanthropy and maintains a huge public presence in Australian sport. With such a public persona, it is not hard to see how hair loss therapy could make a big difference. Shane Warne had been seeking therapy for his hair loss, for a while, before working with Advanced Hair Studio. We recommended our Advanced Laser Therapy program. Shane is one of many public figures to have been assisted by Advanced Hair Studio’s services, and he will not be the last. Through his work as a brand ambassador, Shane is committed to helping to popularise hair loss therapies and to make sure that everyone can get a second chance with their hair, no matter how far gone. 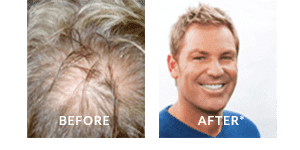 Shane Warne’s hair continues to be a standout example of the positive results of our services; the results speak for themselves. Since first starting with us, Warne benefitted enormously from our Strand-by-Strand Blitz™ treatment program. This industry-leading treatment combines the most effective components of multiple therapies, in order to completely restore hair for even the most damaged of scalps. By combining our patented Strand-By-Strand Program and Advanced Laser Therapy, the results have been impressive; a full head of strong, naturally regrown hair, totally undetectable.